Previously in this SSMC series we installed the SSMC and today we will look at adding 3PAR systems to the console. To add and remove systems from SSMC you use The SSMC Administrator Console. 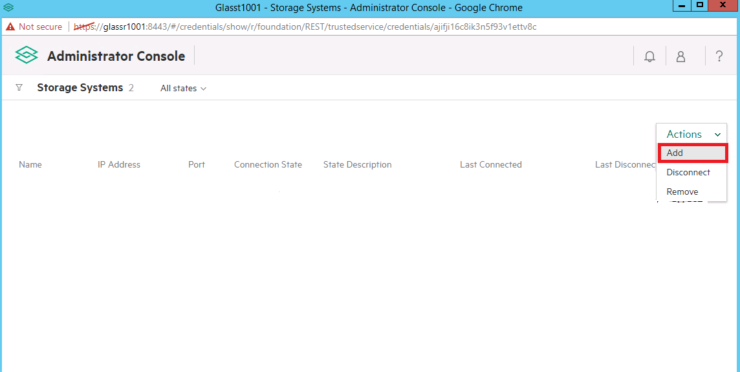 1 Connect to SSMC Administrator Console by entering the URL https://yourSSMCserver:8443/ in a supported browser. When you launch SSMC for the first time you will be forced to set the credentials for the SSMC Administrator. 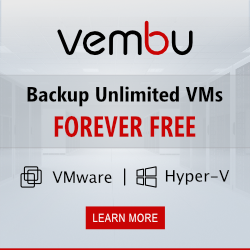 The administrator is the user that has the rights to add and remove StoreServ’s from the console. 2 You then set the username and password you wish to be the administrator for the StoreServ Administrator Console. Here is where the common misconception is, there is no default username or password for StoreServ administrator console it’s whatever you chose it to be! 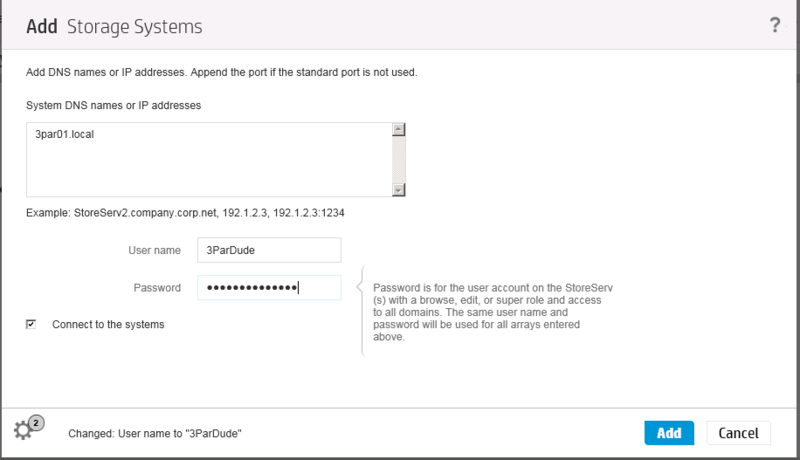 The Administrator Console is intended to control the connection state of the 3PAR systems and to set the admin credentials for the SSMC Administrator Console. As well as adding systems they can be removed and disconnected, this is achieved for highlighting the system and choosing the option you require from the action menu. 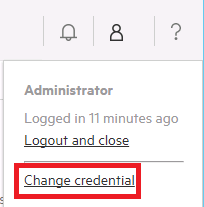 If you wish to reset the administrator credentials for the SSMC administration console first login then choose session which is the icon that looks like a person in the top right corner and select change credentials. Also take a look at newbies guide to using SSMC and setting Threshold Alerts. Keep up to date with future posts by following on Twitter. after you run the bat file what do you do to set the new password? what if you dont know the username? Hi, I understand the part where you add a 3par to ssmc using its ip address, but how is that ip address set on the 3par in the first place? Do we have to open port 5783 as well on the SSMC server or it will take care of it automatically? or you can assign port 5781 or 5782 specifically for SSMC. I know port 8443 is default but it is using for initial setup of SSMC. I asked about port 5783 because in above description while you add your systems (arrays) through administrative console, I saw port 5783 next to IP address. Therefore want to confirm if we have open port 5783 as well along with 8443. I want to add new 3PAR 8440 to ssmc, but when I try to accept the certiificate the accept and cache button grey out. do you have experience this before? This command will clear the SSMC Administrator Credential. You must restart the SSMC server for this to take effect. Which is the reason “Local admin credential not found” ? Our virtual ssmc has two windows accounts, 3par and 3parmanager. Any idea if these are required for an SSMC on windows? The windows server is on the domain. There is no specific need for windows user accounts. Why not migrate to the latest SSMC which is an appliance anyhow?